To ensure that your vehicle is ready to handle everything thrown its way, come to our Subaru dealership near Fountain, CO, to buy or order OEM Subaru parts. Keeping up with your vehicle's maintenance needs is the No. 1 way to keep it in tip-top shape and running for years on end. 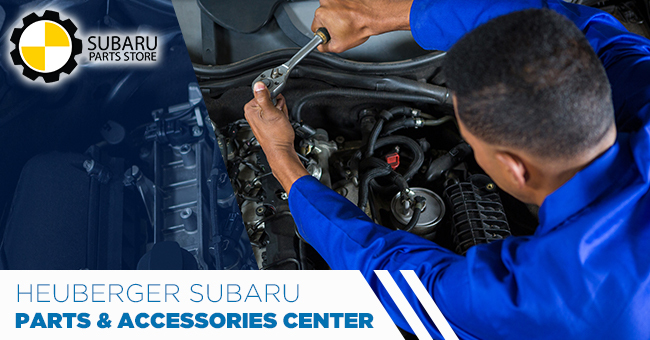 When the time comes to order OEM Subaru parts and accessories, be sure to visit Heuberger Subaru and speak with the knowledgeable staff at our on-site parts center. We have a wide selection of genuine Subaru parts, and we can help you find whatever you need. Whether you need parts for your Subaru Outback or Forester, we've got you covered. Come and speak with the parts center team and order the part you need and feel free to install it yourself. Or, if you'd rather it be done by a professional, bring your vehicle in anytime during our service hours Monday through Saturday and let one of our Subaru techs install it themselves. Are you looking to enhance your overall experience? Then you can order Subaru accessories from our parts center, too. Order an available roof rack so you can tie up whatever you need for a weekend getaway. You can also order carpeted floor mats for a better appearance. Plus, you can add available tech features for a more enjoyable commute. Order subwoofers, auxiliary jacks and iPod interfaces for a more personalized ride, and an available rear seat entertainment system will provide hours of fun for your crew. Come to our Subaru dealership for all your genuine Subaru parts and accessories needs. Speak with a parts associate when you contact Heuberger Subaru! The Parts Department at Heuberger Subaru maintains a comprehensive inventory of high quality genuine OEM parts. Our highly knowledgeable staff is here to answer your parts inquiries. Should we not carry a part for which you're searching, we can always order it for you and receive it within a timely manner. No returns after 30 Days. All returned goods must be in original packaging and accompanied by receipt or invoice. No returns on electrical. Electrical components are delicate and require very specific installation procedures that we have no way of verifying have occurred, therefore we cannot accept returns on electrical components. Manufacturer warranty for these components may still apply; inquire for details at time of purchase.